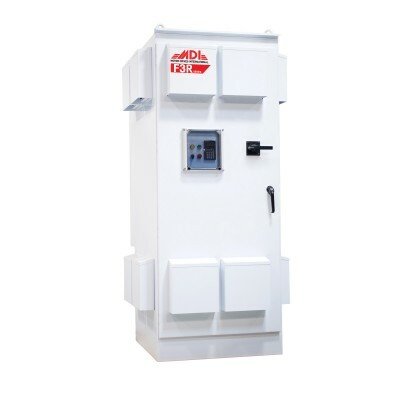 If you have an AC motor-driven application that does not need to be run at full speed, then you can cut down energy costs by controlling the motor with a Variable Speed Drive (VSD). Variable Speed Drives (Also known as Variable Frequency Drives) allow you to match the speed of the motor-driven equipment to the process requirement. Variable speed drives, and the loads they are applied to, can generally be divided into two groups: constant torque and variable torque. The energy savings potential of variable torque applications is much greater than that of constant torque applications. Variable torque loads include centrifugal pumps and fans, which make up the majority of HVAC applications. Constant torque loads include vibrating conveyors, punch presses, rock crushers, machine tools, and other applications where the drive follows a constant V/Hz ratio. In variable torque applications, the torque required varies roughly with the square of the speed, and the horsepower required varies approximately with the cube of the speed, resulting in a large reduction of horsepower for even a small reduction in speed. A motor in a variable torque application will consume only 25% as much energy at 50% speed as it will at 100% speed. This is referred to as the Affinity Laws, which define the relationships between speed, flow, torque, and horsepower. 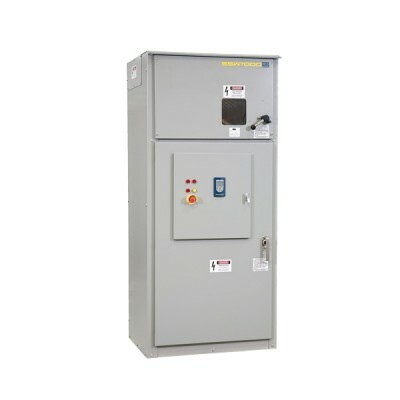 Variable Speed Drives (VSDs) allow you to consume less energy than other speed control techniques when load requirements are less than full speed, as is usually the case in HVAC applications. No other AC motor control method compares to variable speed drives when it comes to accurate process control. Full-voltage (across the line) starters can only run the motor at full speed, and soft starts and reduced voltage soft starters can only gradually ramp the motor up to full speed, and back down to shutoff. Variable speed drives, on the other hand, can be programmed to run the motor at a precise speed, to stop at a precise position, or to apply a specific amount of torque. 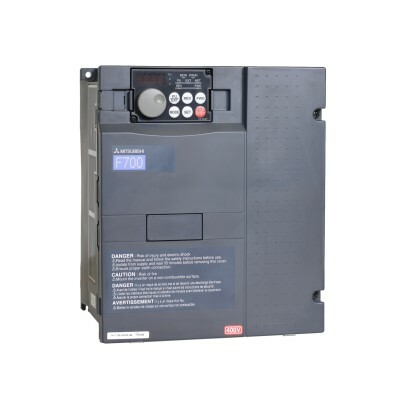 In fact, modern AC variable speed drives are very close to DC drives in terms of fast torque response and speed accuracy. AC motors, however, are much more reliable and affordable than DC motors, making them far more prevalent. Most drives used in the field utilize Volts/Hertz type control, which means they provide open-loop operation. These drives are unable to retrieve feedback from the process, but are sufficient for the majority of Variable Speed Drive applications. Many open-loop variable speed drives do offer slip compensation though, which enables the drive to measure its output current and estimate the difference in actual speed and the setpoint (the programmed input value). The drive will then automatically adjust itself towards the setpoint based on this estimation. Most variable torque drives have PID capability for fan and pump applications, which allows the drive to hold the setpoint based on actual feedback from the process, rather than relying on an estimation. A transducer or transmitter is used to detect process variables such as pressure levels, liquid flow rate, air flow rate, or liquid level. Then the signal is sent to a PLC, which communicates the feedback from the process to the drive. 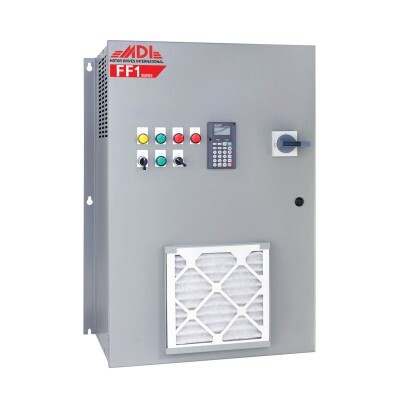 The variable Speed Drive uses this continual feedback to adjust itself to hold the setpoint. High levels of accuracy for other applications can also be achieved through drives that offer closed-loop operation. Closed-loop operation can be accomplished with either a field-oriented vector drive, or a sensorless vector drive. The field-oriented vector drive obtains process feedback from an encoder, which measures and transmits to the drive the speed and/or rate of the process, such as a conveyor, machine tool, or extruder. The drive then adjusts itself accordingly to sustain the programmed speed, rate, torque, and/or position. Single-speed starting methods start motors abruptly, subjecting the motor to a high starting torque and to current surges that are up to 10 times the full-load current. Variable speed drives, on the other hand, gradually ramp the motor up to operating speed to lessen mechanical and electrical stress, reducing maintenance and repair costs, and extending the life of the motor and the driven equipment. 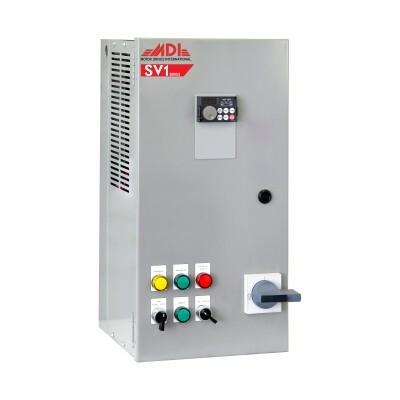 Soft starts, or reduced-voltage soft starters (RVSS), are also able to step a motor up gradually, but drives can be programmed to ramp up the motor much more gradually and smoothly, and can operate the motor at less than full speed to decrease wear and tear. Variable speed drives can also run a motor in specialized patterns to further minimize mechanical and electrical stress. For example, an S-curve pattern can be applied to a conveyor application for smoother decel/accel control, which reduces the backlash that can occur when a conveyor is accelerating or decelerating. At the instant of energization, the locked rotor (zero-speed) is about 600% of full-load running current This heavy current then drops off gradually as the load breaks loose, and the motor comes up to speed, but causes unacceptable voltage sag on the power system, adversely affecting other loads. It can also cause shock damage and long-term excessive wear on the motor. Using this starting method may force the utility to impose a limit on the size of motors you can use, since across-the-line starting causes problems upstream into the utility's system, creating problems for other customers. The switching surges of abruptly starting and stopping create stress on the motor insulation. I have a little question about motors under vsd control. Suppose I have a pump driven by a 150kW motor and controlled by a vsd controller. In a 400v 3 phase system, what will be the approximate current drawn from the line when the motor is running at full speed? For a 150kW (200HP) at 400V, it is about 220-240A. But at full speed, it is basically running across the line. You will get little to no energy savings. Energy savings only happens when you run at below 100% speed. Hope that helps. Can a conventional air conditioning unit be converted to a vsd cost effectively without having to change out the complete system? I heard about VFDs as a way to convert single phase power to 3 phase, yet that is not mentioned at all here. Was I misinformed? VFDs can indeed convert single phase input to three phase output with some limitations. However, it is not the main purpose of the VFD invention, that is why it was not mentioned in the article. I inspired from your writing. This is knowledgeable and help alot to new learner. I will come back to your site to read more articles are certainly more interesting. Greetings to all, I really love your writing this because it is very inspiring for the crowd. You are welcome Chris! Let us know if there are any specific topics you would like us to write about!